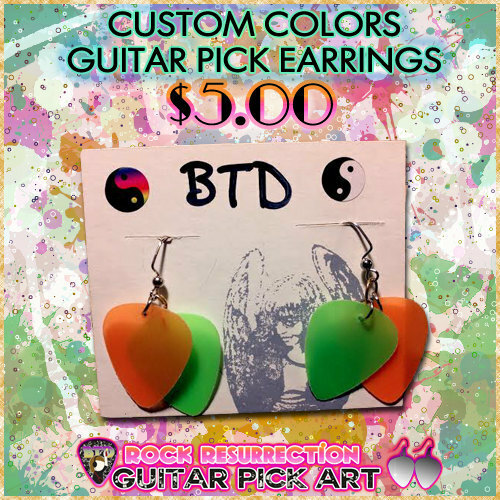 GET A CUSTOM PAIR OF GUITAR PICK EARRINGS! Two colorful guitar picks for each side! Pick your colors! You can also just have one kind of pick, just choose one color. Patterns are also available: Zig Zag and Harlequin. Picks are made from nylon sheeting, polypropylene, Acrylic sheeting, styrene, and plastic. Each item comes with a cardboard paper or foam backing to keep your piece on. Rock Resurrection Art is part of the Bite-the-dust.com rock n roll family.